Dinner @ Tomate Rouge with some esteemed wine fellows, a collection of wines of Piedmont and one Tuscan. Giuseppe Mascarello 1978 Barolo Villero: started very bright, almost hot, but quickly mellowed into a lovely aged Barolo full of life and energy. The best wine of the night. Roagna 1978 Barbaresco Crichet Paje: all meaty beef broth on the nose with some classic Barbaresco flavors. Giuseppe Mascarello 1991 Barolo Monprivato: very young, but in a good way, not in a lean muscular way. Structured, but with a solid base of fruit. With some air and time it opened up nicely. The Tuscan: Talenti 1985 Brunello di Montalcino was a good showing, but up against unfair competition. Had the wine been opened on it's own then it would have been more welcomed. It was definitely less exciting than the Piedmonts. 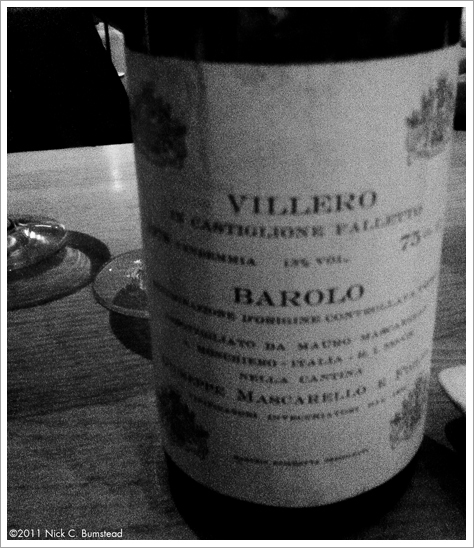 An unfortunately loser of the evening was the Giacosa 1978 -- corked.